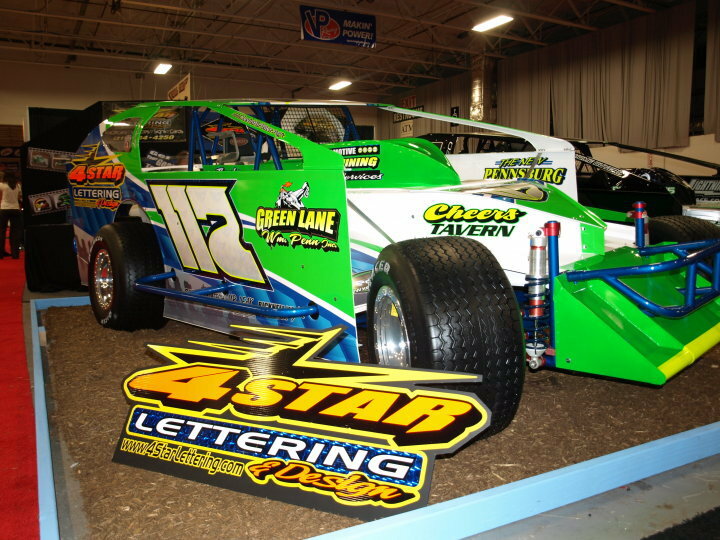 Team 117 returned to Delaware International Speedway this weekend to compete in the Delaware State Dirt Track Championship weekend. Hirthler has been very competitive in past years at the track and this year would be no different. Hirthler timed top 5 fast in hot lap session for the small block modifieds. Unfortunately that was the last time the small block saw the track, cooling system issues forced the team to park the car for the evening. Later in the night Hirthler returned to the track to compete with the big block modified. Qualified 5th place in the heat race transferring him into the main event. Hirthler started the main event 14th and was moving forward and got in a jingle rejoined at the tail end only to be involved in a second skirmish. Hirthler ended up returning once again and ended up with a solid 8th place finish. Look for the team to return to action Saturday October 29th at Hagerstown Speedway for the Octoberfest 350. 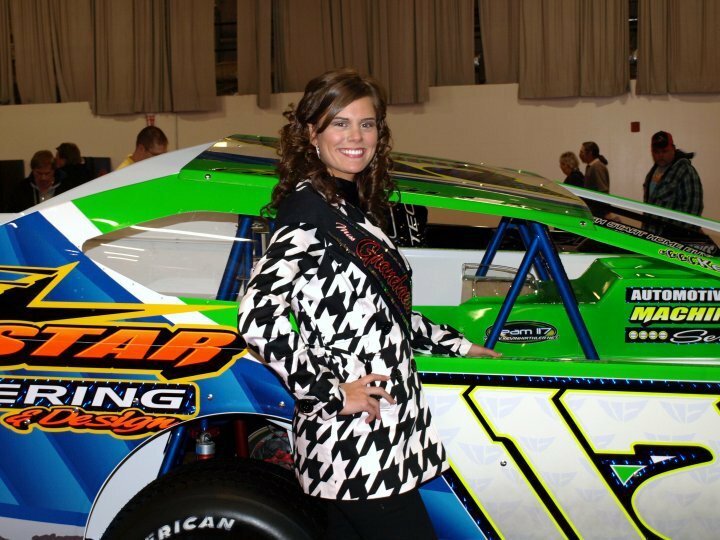 Hirthler has won there once before in the small block event in 2007 and will be looking to add more wins to his 2010 resume. Team 117 returned to Five Mile Point Speedway on Oct. 9th where a year before he dominated the 50 lap feature picking up the feature win. This year was a bit different. Hirthler started 4th in the heat race, finished a strong 2nd, but was moved back to 3rd for a mid race rule infraction. Hirthler started the feature in 15th position and just rode for the first half of the feature waiting to make a charge. At the races midpoint, Hirthler turned up the wick and charged forward placing 9th at the finish. Hirthler said "The car was getting better while others seemed to be fading, the field is lucky it wasn't 100 laps"
Look for the team to return to action Saturday October 16th at Grandview Speedway 5-25 feature events. Hirthler is slated to start the feature in 3rd position by virtue of final season points standings. Team 117 has been having some decent finishes in the month on September. 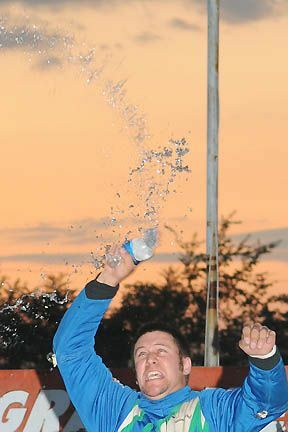 Hirthler won his heat race for the Freedom 76 at Grandview Speedway September 18th. Started the feature in the 13th position and moved forward picking up a 7th place finish. Hirthler backed it up with a top 5 in the open competition race on the 25th. Started feature in the 10th position and fell back early but made a strong charge at the end using the outside groove to pick up a 4th place finish. Team 117 had tough night Saturday. Started off behind the 8ball and never got caught up. Wet track conditions made heat for a tough heat race with a mishandling racecar. Qualified through the consolation race and got caught up in a jingle which hurt the car and Hirthler hung on to finish in the 17th position. Hirthler finished the year 10th in Grandview points, which he will be awarded for at the season ending banquet in November. Look for the team to return to action Saturday September 18 for the Freedom 76 at Grandview Speedway $20,000 to win. Team 117 had a strong outing at the Annual Grandview Speedway Forrest Rogers Memorial. Team 117 qualified in the heat race and which put them 11th in the feature starting grid. When the green waved, Hirthler moved patiently to the front. After a few cautions on lap 9 and 15 Hirthler advanced into 3rd my lap 19, where he would run till lap 43 when defending track champ Jeff Strunk took over 3rd and Hirthler eventually finished 5th. Look for the team to return to action Wednesday August 18th for the WoO Late Model/358 Modified double header at Grandview Speedway Thunder on the Hill. Team 117 was back in the top ten this weekend after a week vacation. Saturday August 7th, Hirthler transfer into the feature through a 3rd place finish in the heat race. The neon green 117 started 10th in the main event and dropped back early fighting handling issues. Sitting 13th on a lap 24 restart Hirthler utilized the late race restarts to his advantage advancing all the way into 7th by the time the checker flags waved. Saturday night Team 117 looked to improve on their sluggish July and it looked as though it would be a great night. After a heat race victory from 8th starting place, Hirthler lined up for the feature in 11th position, after a few laps Hirthler charged into the top 10 after being trapped in by slower cars in the beginning laps. On lap 5 Hirthler attempted a slide job in turns 1 and 2 and caught bumpers with a competitor sending the 117 spinning down the track ending the chances as a great feature finish. Look for the team to return to action Saturday July 24th to take on the high banks. Stop back in the trailer after the races to buy a t-shirt, sweatshirt or get an autograph. Team 117 took to the track as part of the Thunder on the Hill ROC race Wednesday night. When the green flew in the 2nd heat race Hirthler raced into the lead from outside pole, to much surprise the brakes went to the floor entering turn one and the car brushed the turn 1 breaking the wall breaking some components which ended the night early for Team 117. Team 117 has been up and down the month of June with 3 top ten finishes and 2 DNQ's. Look for Kevin and Team 117 to try to turn around the season tonight at Grandview Speedway for the ROC 60 Lap big block event. "They say that no news is good news. 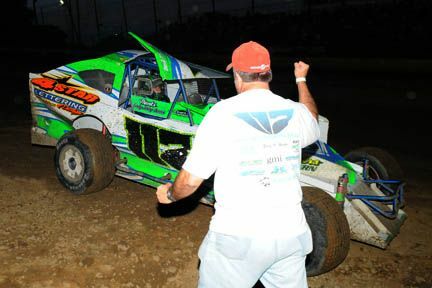 In our case no news has been bad news"
Team 117 got back on track June 12th at Grandview Speedway. Team 117 has had struggles the last two weeks. One feature ended prematurely with impact to the outside retaining wall, and another night was cut short from a 1st lap heat race incident. Team 117 took center stage on saturday night picking up the teams first win of the 2010 season. Hirthler, 30 of boyertown, started out the night in an exciting way making a bold statement in the heat race and picking up the victory from 9th starting spot. This was more impressive heat victory than normal because many cars had a tough time making there way front on the heavy race surface caused by the early afternoon rain. Come feature time there was an aggressive outside groove forming, and a fast racetrack remained. Hirthler avoided many incidents along the way to victory including a turn 4 jingle that almost left Hirthler stopped, but he was able to get through. Moving along meticulously through traffic, Hirthler on a Lap 15 restart made a power move in the outside grove passing Duane Howard & Jordan Umbenhauer to move into second position. For the next 3 laps Hirthler raced with Troy Wink eventually taking the lead on a sling shot move on Lap 18. A Lap 27 Caution saw Howard in the 117's rearview mirror however when the Green flags waved Hirthler powered away and picked up the victory. Team 117 had an ok finish to the season. The team ran hard all year long and finished seventh in the final Grandview Speedway point standings. Hirthler made a few late year starts, one being the SuperNationals at Five Mile Point, Hirthler won the $5,000 feature picking up his first feature win in New York , and making it the fifth different state he has been victorious. The race was promoted by Brett Deyo, he did a great job getting 70 some cars and running a smooth show, hats off to him. Team 117 a few other shows, had some struggles and success, November marks the start of the off season, Flea Markets to sell off some used equipment, and trade shows to find out what is new for 2010. Team 117 had the first outing of 2009 on Thursday the 13th at Grandview Speedway for a 40 lap Thunder on the Hill show. After picking less than average Hirthler ran a smooth heat race but failed to qualify. After finished second in the consolation race Hirthler started the feature from the 20th position, after a few tangles, Hirthler placed his Bicknell inside the top 12 around lap 30. On a restart a small mishap in turn 2 resulted in a car tagging the #117 in the rear and ending our chances at a decent top 10 finish. On saturday night the track was wide and fast on the edge, running the slick track combination left Hirthler struggling and a bit tight in the heat race, After winning the consolation race by over a straight away, Hirthler started the feature event in 21st spot and was challenging through the pack, and got caught up in two mishaps. Hirthler rebounded for a 15th place finish. Kevin Hirthler & Team 117 will be back in action August 22nd at Grandview Speedway. Stop back in the pits and say Hello! Team 117 had a solid performance at Grandview Speedway this past Saturday. Right before heat race action light drizzle began to fall, not to be hampered by the weather, the races continued as scheduled. After starting deep in the heat race, Hirthler made advances in the heat race running 6th for the majority of the race and made a bold outside run the final 2 laps to capture 4th position and the handicap transfer spot. When the feature rolled out on the track the drizzle was patchy, but the races moved along. Team 117 started in the 14th position and after a jingle on the start got pushed back as far as 20th. Not to be denied Hirthler started his charge back to the front, as the laps ticked of the lap board, the Bicknell chassis #117 was moving front. By lap 8 Hirthler was back to 14th and after a lap10 restart charged into 8th. When the checkers flew Hirthler rebounded to finish 6th and turned out to be a solid points night. Kevin Hirthler & Team 117 is preparing for Thunder Action this Thursday Aug. 13th with Big Block Modifieds and World of Outlaw late models. The team will also be back next week August 15th looking to continue to move up the point standings in a late season surge. Stop back in the pits and say Hello! "Not a Memorial to Remember"
This past Saturday was a special event in memory of Forrest Rogers founder of Grandview Speedway, the race was 50 laps $10,000 to win. Team 117 came into the night on a good run finishing inside the top 10 in 6 of the last 7 races. After starting tenth in the heat race, Hirthler used various lanes on the ultra fast racetrack to get to the front. By the time the checkers waves Team 117 was satisfied with their 3rd place finish making the invert to start in the top 16 in the feature event. Kevin Hirthler & Team 117 will be back next week August 8th looking to rebound after a not so stellar performance. Stop back in the pits and say Hello! On to the scheduled nightly action. Hirthler used the same 2009 Bicknell that he ran in the first feature. Heat race struggles led to a consolation start. After finishing second in a top heavy consolation, Hirthler started 24th on the grid. Early on in feature action Hirthler had the 117 on a steady pace to the front, the 117 began to emit patchy light smoke halfway through the race. A relatively quiet night for the normally bold action filled nights the team is used to. Hirthler advanced as high as 10th in the feature before falling to 12th by features end. After the feature it was found that smoke was coming from a failing power steering pump. With the dry conditions and a hindered car the 12th place finish was good, given the circumstances. Team 117 will be back in action August 1st for the $10,000 to win Forrest Rogers Memorial at Grandview Speedway. Come back in the pits after the races and meet the driver and crew, as well as the get a photocard & autograph. "Bing, Bang, Boom: I Got a Win"
Hirthler brought out the backup car for the nights scheduled action, starting 9th in a loaded heat Hirthler advanced into 5th by mid race and stayed there until the checkers waved. Hirthler started the feature race in 18th position advancing inside the top 10 by lap 3. While racing hard the left rear tire started to fail and by lap 7 it gave out and Hirthler took the 117 pitside for repairs. Rejoining the field Hirthler rebounded nicely on the dry slick track taking home a respectable 10th place finish, making it his 7th top ten of the season at Grandview. Making up for the earlier event, it was VonDohren that took home the victory in the second feature making him the 3rd repeat winner of the season. Finally the rain has cleared and action got back underway Saturday night, and what a night it was. After starting 8th in the 4th heat, Hirthler advanced quickly to 4th before a mid race caution, Once back green, Hirthler had the 117 sailing on the top of the racetrack and reeled in the race leader and made the pass for the the top spot on lap 10 continuing on to take the heat win. When feature time rolled around Hirthler used his 11th starting position to his advantage letting the cars spread themselves out. After losing a brake like in a turn 3 contact, entering turn one the brakes went to the floor, contact was made with another car that led to the 117 being sent to the rear of the field for a rule infraction. Not to be one to complain about official calls, Hirthler accepted his fate and fell to the back of the pack only to charge back through the field to a respectable 10th place finish with a less than perfect car. For the second week in a row Team 117 failed to complete a lap in the heat race. After starting deep in the consolation race Hirthler drove through the field to capture a spot in the nights feature action. From 28th starting positon the 117 was on a move sorting out the field. After a caution plagued start to the feature, Hirther was itting in 15th position on a lap 6 restart. Seeming to be in good company Hirthler let down his guard and figure it was time to make a move. Entering turn 3 on the 7th lap a car spun down the track collecting Hirthler and injuring the car and ending chances at a drive to the front. Ironic enough at that point Hirthler was sitting one position behind eventual feature winner Billy Pauch Jr.
"Place in the Heat Race"
Team 117 hasn't been struggling, however we haven't been very lucky either. Having to the run a consolation event 3 weeks in a row, its obvious heat races haven't been going our way. On a positive note Hirthler is 3 for 3 in those consolation races and progressed in each feature no less than 9 positions. In those 3 weeks tangles and track conditions limited further progress. Team 117 still remains in the top ten in the season long point standings and looks for better performance in the coming weeks. Team 117 brought out an old friend on Wednesday nights Thunder on the Hill show. That friend was an older Bicknell car that was used in the 2007 campaign at Grandview Speedway was used for action. After picking number 7 from the bag, Hirthler lined up in position number 2 in heat 3 outside the potent #4 of Duane Howard and current 358 modified point leader. On the initial start, Hirthler utilized the fresh Doug Meyers engine under the hood, and motored by the #4 car and into the lead. However on lap 3 the 117 got high and crossed up in turns 1 and 2 and Howard took advantage and passed going on to win the heat race with Hirthler getting a close second. Hirthler started the feature in position number 4 after the re-draw. Hirthler advanced as far as 3rd before slipping back to 6th position by lap 12 where he would remain for the second half of the race giving Team 117 their 4th top 5 finish in their last 5 Grandview Starts. Overall it was a successful night to break in the back up car & engine for the 2009 season and add a top 10 to the stat sheet while doing so. "And then the Rains Came"
With an 80% chance of rains forecasted for Saturday, the thought of getting to race was slim. However, 7:30 rolled around, with no rain in sight, the green flags flew for the evenings first event at Grandview. Hirthler's 8th place in the point standings had him lined up 10th in the first heat, with a few cars not starting the event because of equipment issues, the actual start was 8th. The track was fast and tacky and Hirthler was charging to the front utilizing the outside groove. A lap 3 tangle with a slower car entering turn 1 resulted with a right front flat on the 117. After a quit pit stop, the 117 returned to action and ran much of the race in 7th until a late race charge brought him home in the 6th spot. After a second place finish in consolation action, Hirthler lined up in the feature in 23d positon. With a light rain sprinkle starting to fall on the ground, the green flags flew for the start of the feature, looking strong on the opening circuits and charging on the high side, Hirthler passed a few cars to break into the top 20. On a lap 8 caution for point leader Duane Howard , the rains intensified and racing action was put on pause to be completed next Saturday May 23rd. Was a quiet night for Team 117 on Saturday. Hirthler Started the first heat outside row #5 and remained patient throw a caution plagued race. A few late race maneuvers to the front gave Hirthler a solid 4th place finish and transfer spot to the feature event. Once feature time came, the track had changed completely to the point where it took rubber and locked down. After the first 10 laps Hirthler fell from 9th starting position to 12th. Once the green flag flew on the restart Hirthler found the fast line and took off challenging through the field and advanced as far as 7th before being passed by Duane Howard where he would stay for the duration of the event. The 8th place finish was Hirthler's 3rd top 10 in 4 feature starts at Grandview and moved him to 8th in the point standings. On a side note the team has been well fed the last few weeks courtesy of Bounce's Pit Kitchen. Serving some of the best pit food in the area. Thanks again Bounce the food was excellent. Saturday night was "just one of those nights" The #117 started deep in a heat race that ran nonstop forcing Hirthler to the consolation race. The track was fast in the consolation races which resulted in little passing forcing Hirthler, as well as Strunk, to use provisionals to participate in feature action. When feature time came, you knew the top was going to be fast and aggressive. The beginning laps Kevin was getting through traffic when contact sent him to the pits during the first caution of the night. After rejoining at the back of the pack, Hirthler was taking it easy with intense traffic when a lap 5 backstretch congestion left the #117 with no place to go sending the Bicknell on a barrel roll down the Grandview back stretch. After surveying the damage Hirthler returned to the cockpit and took the car to the pits to change a right front flat and once again returned into action energizer bunny style. After a 3rd skirmish exiting turn two on lap 17 the team decided to cut their losses and load up for the night. Saturday was a smooth night for Team 117. A 8th place starting position in the 4th heat race enabled Hirthler to use the top and bottom grooves to work to the front and capture a 3rd place finish. Staring 16th in the feature, Hirthler was biding his time for the first 10 laps letting the track come to him. The track came to his liking and Hirthler advanced the Automotive Machining Services Bicknell into the top 10 on lap 13. A few late race cautions resulted in restarts and Hirthler took advantage moving the 117 inside the top 5 on a lap 28 restart. Team 117 came up 4th when the checkered flags flew, giving them a great finish for the second week in a row. Sunday night Hirthler used the Teo pro Big Block for the DIRT race at Big Diamond Raceway. Hirthler had handling issues, but qualified through the consolation race. A altercation about 1/3 of the way into the race left the 117 too heavily damaged to continue feature action. All in all, it wasn't a bad outing for the team, considering the number of quality cars that did not qualify for the feature event. Team 117 started out the 2009 season on a rough note. Hirthler steered the 117 into the top 5 at Hagerstown's small block race, however the race isn't over till the checkered flag waves, a late race jingle sent the 117 spinning, after contact in the rear from a competitor. Moving on to the Grandview opener April 4th, a heat race collision at the Grandview Speedway opener sent the 117 into a 4 wheel slide into the inside rail resulting in heavy front end damage, in the end it resulted in a DNQ. August 30th at Grandview Speedway was an exciting night for Team 117. The night was sponsored by Green Lane Wm Penn/ 4 Star Lettering, which happen to be Hirthler family businesses. The fans had their chance to come to the races early and check out the display set up in turn 1 of the speedway. We had many hand outs to offer including: T-shirts, frisbees, cold drinks, candy, pens along with many other things. Fans also had their chance to meet Kevin Hirthler, talk and get an autograph. Hirthler, a family man, always tries to spend time promoting himself as well as the sport. When time came to roll out on the track Hirthler had a mishap in the heat race which forced him to qualify 3rd through a not so easy consolation race. When the feature rolled onto the track Hirthler was ready to put on a show for the many fans that entered the track gates to watch him compete. While racing forward Hirthler got in a tangle in turns 3 & 4 which sent him to the rear of a difficult field of cars. Once back on the gas Hirthler rebounded with the Bicknell chassis to finish a respectable 12th place finish. Saturday July 26th was a better week for Team 117. After a few weeks of struggles the car was back performing at an acceptable level. The car isn't 100% perfect, but its getting closer to where it needs to be for the drier track conditions. With an 7th place starting position and a mid race caution, Hirthler was able to pick up the heat race win. Come feature time, Hirthler started 8th on the grid. A early race duel with Craig VonDohren, seemed like the race for the win. VonDohren won the race to the front and stayed there throughout the feature which gave him better position on the restarts. On a lap 21 restart, Hirthler tried a bold move for the lead on the outside of turn 1 & 2, however dry conditions limited traction for the Doug Meyers powered Bicknell, which dropped Hirthler back to 4th where he remained till the checkered flag flew. All Joking aside, as of late Team 117 is in a midseason slump. Its an out of character struggle for the normally fast and competitive team. The feature performance Saturday pretty much is a recap of the last month. The car is about average in the qualifying races, track position hasn't been a problem, but the car just has not been performing up to Team 117 standards. Due to the double night racing and midweek shows Team 117 has competed in, the car has not been givin our total attention. We'll be revamping the car front to back and if all goes well, the car should be a different animal next week. However, can't make any promises, this is dirt track racing and that means a a lot of things got to go y our way to be the car in victory lane. Wednesday the 16th Team 117 competed at the Super DIRT Series show at Grandview speedway, a bad time trial led to qualifying via consolation win. A flat right rear tire on the first few laps hurt Hirthler right away, after a quick pit stop Hirthler continued to race, but left with bad track position the leaders were knockin on the door within 10 laps. After being lapped Hirthler retired from the event to save the car, tires and fuel for another day. Which turned out to be a smart decision. Saturday Hirthler transferred through the heat race which put him 10th on the starting grid for the feature. After a early race surge to 5th the car went away and left Hirthler hangin on for a top 10 finish. A lap 22 cut left rear tire retired Hirthler from the event early. Which left him with a 23rd place finish. Due to the struggles with our Saturday night program, Team 117 will be cutting back on other racing ventures until we get things straightened out. Pictures are included from the July 16th race at Grandview from the Pre-race autograph session on the front stretch, and post race with fans in the pits. 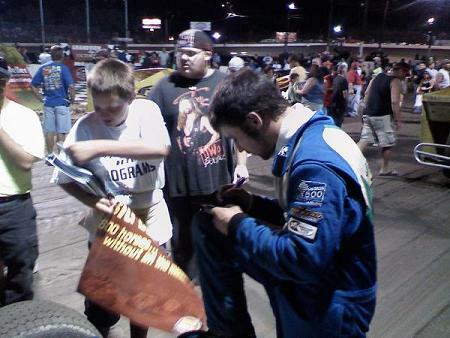 Hirthler is always a fan favorite and always makes sure kids get their autographs. Team 117 also got new photocards (see below) last week, so stop back in the pits, meet the Team, and get one signed. Team 117 has been racing alot the last few weeks, running double duty at BDR and Grandview. Team 117 Also competed in the Thunder on the Hill race on July 1st picking up a 6th place finish on the dry smooth track. This passed Friday at Big Diamond Raceway Hirthler was wheeling the Bicknell around the 3/8 mile, heat race struggles led to qualifying through the consolation race. That put Hirthler in the back of the starting grid, he raced hard and moved into the top ten around lap 20. Hirthler had to pit with 6 of the 35 laps remaining and was unable to rejoin the field. Saturday night Hirthler again had heat race struggles while running 5h with 2 laps remaining a lapped car slowed on the bottom of the track which left Hirthler nowhere to go sending him spinning. Hirthler aka "The General" rebounded to qualify through the consolation race and that started him 28th in the feature event. Hirthler began his charge to the front when a left front flat sidelined him on lap 5. On the restart, Hirthler began slowly working his way toward a top ten finish and with 5 laps remaining he moved into 10th position where he would stay until the checkers flew. Team 117 made a return trip to Big Diamond Raceway on Friday night. The night started out rough with 117 getting sidelined after the 1st lap of the heat race, however Kevin did transfer through the consolation race and started the feature in 25th spot. At the drop of the green flag Hirthler began making moves towards the front and was utilizing the outside high grove to pass cars. When the checkers waved the lime green machine placed 8th, which was a great run for the first time back after not competing at BDR for the last few weeks. That was only the beginning. Saturday night Hirthler made his way into the feature during the heat race action finishing 4th. That put him 8th in the starting grid for the feature. When the green flag waved "The General" was bouncin his bicknell chassis off the cushion and making his way to the front, when the caution flag flew on lap 8. During the restart Hirthler made a bold move to the outside from his 4th starting position taking it 3 wide out of turn 4, Hirthler made it stick and charged into 2nd position down the front straight away and charged into the lead off turn 4, the move had people on their feet only to be wiped away from a second caution flag as Hirthler came off turn 4. He restarted in 4th and charged into 3rd where he ran for most of the race using the high side of the track, Meme DeSantis and Jeff Strunk passed Hirthler in the closing laps as the car "went away". Team 117 was happy with the 2 top tens one being a top 5 and look for more good finishes in the coming weeks. Team 117 has been having a few problems in the last few weeks, 3 flat tires and a 2 broken shock mounts have sidelined the potent 117 in 3 out of the last 5 features. The car has been fast and drivable, but the finishes haven't been coming. Rain forced the cancellation of the races at Big Diamond Raceway on friday night May 9th. Saturday night was alright for Team 117. After starting deep in the 1st heat with extremely heavy track conditions Hirthler only made it to 8th position before the checkerd flag flew. Started out 7th in the consolation race only to make it to 5th before side by side racing of the 3rd and 4th place cars left Hirthlers hands tied as he couldn't advance into a qualifying spot. Hirthler however had a provisional to use since he was currently top 10 in points. He started deep in the feature and began to work his way to the front when he had to go pitside on lap11 for brake issues. After some thrifty repairs, he returned to the track and showed great progress and salvaged a 9th place finish. During a post race check of the car Team 117 found that a deflating right rear tire limited the ability for Hirthler to advance positions in the closing 5 laps. The weekend started out with a DNQ at BDR, after a heat race spin & collision, which left the 117 sidelined for the rest of the nights action. The car is being repaired and will be back in action this Friday night May 9th at the fan friendly Big Diamond Raceway. The action got hot right out of the box for Team 117. After starting 9th in the heat race Hirthler advanced into 6th by lap 3, after a restart Hirthler roared to the front and took over the lead by lap 7. Hirthler lead till the finish, which marked his 3rd heat race victory of the season. The feature was a different story. Kevin started off in the 10th position and was holding steady and patient, when a 3rd turn tangle sent the 117 into a spin on lap 4. Hirthler restarted at the rear of the field in the 26th position and began using the high side of the speedway to come through traffic. Kevin took home a respectable 10th place finish, which moved him into 9th position in the point standings. Friday night at Big Diamond Speedway Hirthler, while moving towards the front from his 11th starting spot, was involved in an early race incident. Following a pitstop, the lime green 117 raced back through the field to captured a 7th place finish. Saturday night at Grandview could only of been better had it ended with a feature victory. Hirthler walked away with a heat race victory after a crowd pleasing 10 lap battle with Craig VonDohren. Hirthler started the feature in the 12th position, he stayed steady and patient in the beginning circuits around the high banks. After lap 10, Hirthler had the Bicknell chassis working all over the race track and began to march through the field. A late race caution tightened up the pack and Hirthler was able to advance from 4th position, to pick up a year high 3rd place finish at Grandview Speedway. Kevin Hirthler and Team 117 would like to thank all the fans, sponsors, drivers and other guest for coming out to support our racing bash on saturday night at Cheer's Tavern. It was a great time for all that attended. We will be looking forward to seeing everyone out at the races every friday and saturday night along with select special events as the schedule permits. Team 117 has arrived in Florida to compete in the SDS southerntour at Volusia Speedway Park. The week consists of 4 races starting wednesday and finishing up saturday night. Check back later in the week for updates on the performance of Team 117 in the Florida tour. four inches of rain that finally exited the area Saturday morning. event winner, took top honors in that event. Hirthler's inside move won the race. the lapped traffic got a little screwy there and I was able to sneak by him. 27.Ryan Grim; 28.Sean Merkel; 29.Wade Hendrickson; 30.Chad James; 31.H.J. Brightbill, Tom Hager, Kurt Spotts, Rodney Cordrey Jr.